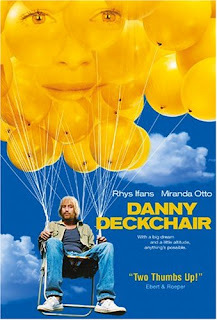 Inspired by actual events, this offbeat romantic comedy follows Australian blue-collar prankster Danny as he ties a batch of large helium balloons to a lawn chair and takes off for adventure. After crashing in a distant town, he starts a new life for himself while wooing beautiful police officer Glenda. But can their new relationship survive when Danny's high-flying stunt causes a media sensation? Rhys Ifans, Miranda Otto, Justine Clark star. 100 min. Widescreen (Enhanced); Soundtracks: English Dolby Digital 5.1, Dolby Digital stereo Surround; Subtitles: English, Spanish; audio commentary; featurette; theatrical trailers. This is by far my favorite film ever. The film is filled with comedy, romance and has embedded in it a heartwarming story of one man's love for adventure. Rhys Ifans and Miranda Otto possess great chemistry to the point where you just don't want the film to end.